Three strikes and I am out. First strike: The night was a wild one, for all the wrong reasons. The rain hammered against the windows, the wind shook the house by the shoulders and sleep was patchy. The morning broke, a little stunned but dry. Although heavy thundery showers were forecast, I decided to risk it for a biscuit. As I loaded the car I chose to ignore some pioneer drops. Second strike: My vertigo had reared its ugly head again overnight and wobbly-itis was corrupting my sight and balance. It was not too severe though, I was confident that it would improve as the day progressed and if not I could always come home again. A nice steady drive out to Lord and Lady Mantle’s estate. Third strike: About a quarter of my way to work, with the downpour getting into its stride, there was a sign blocking my way “Road Closed, No Access to Combe Martin”. As I wasn’t going to Combe Martin how could this refer to me? So myself and a few others took a chance, it is always easier to break the rules in a pack! As it turned out this was an unwise gamble and soon we were about-turned and told to take the diversion via The Back of Beyond. So what do I do when I am feeling under the weather? I make soup. 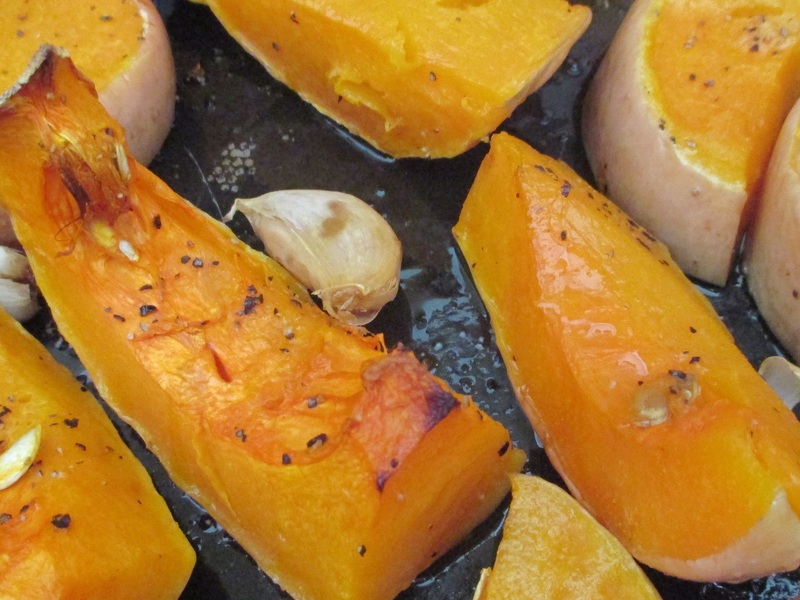 Today it was roasted garlic and butternut squash. I thought I would share it with you. First cut up your squash and remove the seeds, don’t bother peeling. Size is directly proportional to cooking time. The smaller the quicker, the larger the longer. I’m sure you had worked that one out already, but there is always someone who gets a little confused (yes, that’s right, you in the corner!). Arrange carefully in an anarchic manner in a roasting tray. Don’t worry if some seeds make their way in to the pan, they make a nice and crunchy treat for the cook later. Chuck in some unpeeled garlic cloves, as many as you dare and then one more. I think I used 7 or 8. Vampires beware! Douse with olive oil, sprinkle salt and pepper and bung in the oven. I cook everything at gas mark 5 or 6, no matter, it will cook in the end. It will probably take about 45 minutes, or until you smell something heady and honeyed wafting from the oven and shout “oh my God, the squash!”. Meanwhile fry an onion. It is the law to have an onion in every soup. Of course if it is onion soup you will need more than one. When cooked, skin the squash (again no stress if a bit left on) and chop up whilst nibbling on the roasted seed. Add to King Onion, squeeze in garlic (now) paste. Cover and a bit more with vegetable stock. Simmer for a while to let the ingredients get to know each other. Blend. In my house we have a difference of opinion. On many things. Blending is one of them. I am with the smoooooooooth and luscious party. OH is with the chunky and cheerful sector. Up to you, I would never come between a soup and its maker. Check for seasoning. This step was only added because recipes always say that. I am sure it will be just perfect as it is. It was smooth with the odd surprise lump in it! Weather ghastly, vertigo horrible, unexpected road closures DOHHHH!! Lovely recipe, I’m sure it tasted every bit as delicious as your photos look. Interesting about the seeds, I have always scrupulously removed them as I read somewhere they taste bitter – I will give them a try. Not best start to the day, but sometimes it is good to rest a little (and make soup). I will NOT wait until it decides to rain again—I’m rushing to the store to buy butternut squash. It sounds delicious. Thanks G-H. You do quite a fine cooking post! Looks blooming delicious, sorry to read of vertigo and rain though, have you got something to take for the vertigo as that cannot be remotely easy to garden feeling as if you are going to fall over. No they can’t really give you anything except anti-sickness or sea-sickness tablets. Much better today, it is far worse at night. 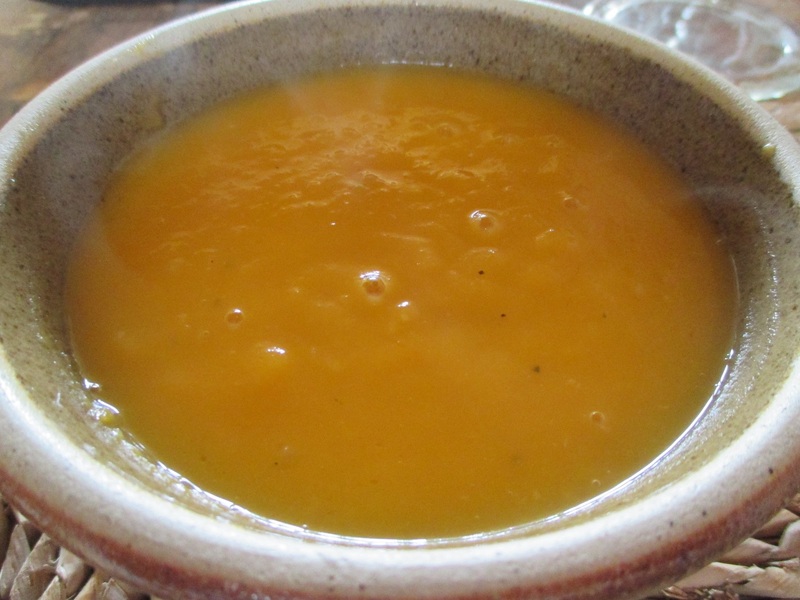 Squash soup – one of my very favorites. I’m pinning this for future delicious eating. Thank you! Will defo try this soup. Please do and report back! I did write a disclaimer at the bottom, didn’t I?